s/v Beach Access pulled into La Ropa two mornings after DrC left us to plump the cruising kitty in Seattle. The girls and I were a bit lonely, a tiny bit nervous about our three weeks alone on the hook, and more than a bit ready for diversion. We could see one scruffy looking gentleman moving around on the deck. He looked tired – which was not a bit surprising. The only way to pull into La Ropa at 9:00 AM is if you have done an overnight from the nearest anchorage up north. He'd been single-handing all night. Our neighbor to the west s/v Sky apparently knew Beach Access and told him to park between the two boats so that we could keep an eye on him while the captain caught a much needed nap. The most striking thing about Beach Access, of course, is that she's a Lagoon 380 catamaran. There are only a half dozen of these boats on the entire western Pacific coastline, so we were excited! We'd seen one up in Bellingham, another in charter in Neuvo Vallarta. But now we had a sister ship clearly in our model range dropping hook not 50 feet off our starboard. Now the girls have a few honorary uncles. These are men that the girls love unreservedly and essentially adopt -- for whatever rhythm or reason motivates them. Their taste is excellent, but even if it were not, DrC and I would just have to roll with it. All three of the girls insist that continued, constant contact with honorary uncles is a minimum requirement for cruising or they will jump ship. It is more important than books, more critical than school friends. The first and most important honorary Uncle is Noey of Seattle. I worked with him for many years at a computer development firm. He's smart, good looking, and in my humble opinion a great photographer. For nearly a year and a half, we had Noey over for Sunday dinner or spent Sunday at his house. The girls consistently cite leaving Noey behind as one of the hardest parts of leaving Seattle. Probably next in the honorary Uncle line is Greg. Another computer geek, we lived with Greg for about 6 months when he and his family rented our upstairs unit. Greg can cook. Greg has a cool cat. Greg is another smart, good looking geek. There appears to be a theme. With Glen, the girls have broken their pattern a bit. Glen is a lot more like their father except a few years older and with more surfing experience. He's a carpenter/contractor by trade, likes Led Zeppelin and Wachowski brothers movies, and has a passion for his boat. We ladies knew within a short period of time that Glen was a great fit for our family. He sincerely enjoys spending time with the girls, and he is great company in the evenings drinking wine with Mom. But more importantly, we knew we had finally found a boat with a guy on it that DrC would relate to instantly. It's a match made in trail magic heaven. On Saturday, the family – including Glen – are going to get our teeth cleaned. 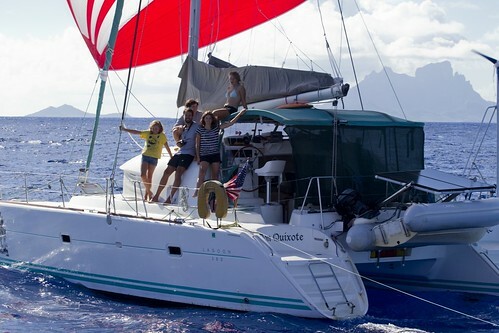 Then we will pull up all four hooks on our two catamarans and start heading north. I don't think this is a matter of us crossing paths on the trip. 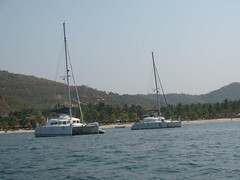 I suspect that these two Lagoon 380s – hulls #60 and #61 – will buddy our way all the way into the Sea of Cortez. So if you pull into a Mexican anchorage this spring only to find two essentially identical cats anchored close enough to pass the PouPon, you'll know you've found us. Ours is the one with the Picasso graphic. His is the clean one. I thought the following was very interesting and a good overview of a similar s/v. Plus it is your new friend's s/v.